I really like verse 31 from our passage today. Here it is in four different versions. Begin to conquer and possess. Begin now to conquer and occupy. Begin to take possession. Begin to occupy. When I read those phrases I want to go conquer something. I want to go take a big, bold faith step and watch God act on a big, bold promise. The Lord had already promised Moses that the land he was to take had already been given to him in verses 27-31. God told Moses to move in and possess the land. Moses did what God said to do. God did what He said He would do, and they took the land. God has made some big promises to us. He promises that if we trust in Him, He will give us wisdom and understanding (Proverbs 3:5-6). He promises eternal life to all who know Him (I John 5:13). He promises that His grace is sufficient for salvation (Eph. 2:8-9). He promises that He will not allow us to be tempted beyond what we can bear (I Cor. 10:13). He promises that all things work together for the good for His children (Romans 8:28). He promises to supply all that we need (Matthew 6:25-34). He promises to produce fruit in our lives (John 15:5). God promises that He has a plan for us (Jeremiah 29:11). God promises peace of mind (John 16:33). God promises that the Holy Spirit will direct and empower us (John 16:7-16). I could go on and on about His promises. When I see God’s promises, I want to go conquer and take possession of the promises that He has made to me. Believing God’s promises and acting on them isn’t always easy, but the rewards are always worth the obedience. I don’t know about you, but I plan on conquering and taking possession of His promises today. Today’s account on the wilderness is pretty detailed, and in the same coin, very simple. Moses explains how God guided them every step of the way. At times, they dealt with his disciplinary hand. At other times, they experienced his incredible blessings. But the reality of the entire situation can’t be understated: they were in the desert… not absent from God’s presence, but still, the desert. Are you in a spiritual wilderness right now? Do you feel like you’ve wandered in circles, waiting for a better land? Don’t forget that there is an eternal Promised Land for you. But don’t overlook the wilderness season. God has much to teach you while you’re in it. Just ask Moses. Or ask David. He’s got a lot to say about the wilderness and the desert. Check out Psalm 63 sometime. What did you learn today from this passage? What did you glean from Moses’ leadership? What sticks out to you concerning God’s plan and purpose for the wilderness? What can we learn from the Israelites’ response to God and to Moses? God had done some amazing and miraculous things to save Israel. He had brought about plagues to Egypt in order to free them from slavery. He parted the Red Sea to help them escape. He had provided water from rocks, food from heaven, and a pillar of fire and cloud to guide them. If this doesn’t show power, love, and trustworthiness to provide, I don’t know what would. So how do the Israelites respond? They get to the land God promised to give them and He says, “here you go, take it. I am with you.” And they answer back that they can’t do it. They basically tell God He is not worthy of their trust. They give Him all the excuses as to why it is impossible. They tell the God who has parted a sea, cast down plagues, and provided water from rocks that the task is impossible. Have you ever done that? I know I have. There are many times we lose trust in God in situations, totally forgetting what He has done and what He has promised to do in our lives. We trust God to save us but, more often than not, we don’t trust Him to sustain us. The Israelites had quickly forgotten what God had done for them and it robbed them of great blessing. None of that generation was allowed to enter the Land. They tried on their own and it failed miserably. Much like us. When we tell God we can do it on our own we almost always fail. And we always miss out on His blessings for us. That whole generation was domed to wander the wilderness for forty years. They had stiff consequences for not trusting God. When we don’t trust God, we too, have to deal with the consequences of our actions. I don’t know where you are at in your life right now…maybe you are dealing with trials and God is saying, “come to me and find peace.” Maybe there is a decision looming and His word says this or that about it. Maybe you are in a place where God is leading you to do something, or say something, or start something and He has told you what it is and you just have to act on it. Whatever the situation is when we trust and follow Him we are like Caleb, we receive a wonderful blessing and when we don’t we are left to wander in the wilderness, wondering what it would have been like if we had just trusted. Which will you be? Hey JumpStart fans – welcome to the exciting book of Deuteronomy! I’m so glad that you continue to be faithful in reading God’s Word each day. For many of you, this is the most consistent you’ve ever been in your Bible Study. I know God is blessing and growing you through it. Today we read about the first encounter the Children of Israel had with the Promised Land – a land given to them by God. 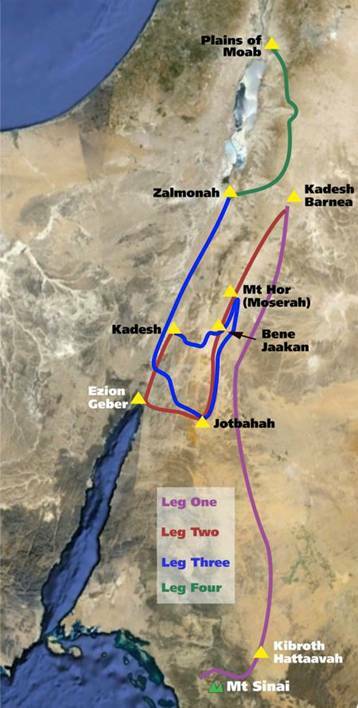 They left Mount Sinai (the place where God gave them the commandments) (v.19) and traveled through the wilderness to Kadesh-Barnea. When they arrived, they could see it, and all they had to do was go and occupy it. This one simple act lead to the beginning of forty years of wandering in the desert instead of living in the land God had given them. How often do you and I get right to the brink of a miracle – right to the edge of experiencing something so big that it could only be explained by God – then we start back-peddling? This could be a chance to serve in an area that we feel inadequate in – and instead of trusting God to equip us – we say no. Or… it could be a witnessing opportunity that God wants to show Himself strong in – but instead we run. What this looks like for you may be even yet different. When we walk with the Lord in the light of His Word, what a glory He sheds on our way! While we do His good will, He abides with us still, and with all who will trust and obey. Refrain: Trust and obey, for there’s no other way to be happy in Jesus, but to trust and obey. Trust God and obey what He tells you to do – no exceptions. Trust and obey – for there’s no other way to be happy in Jesus – but to trust and obey!